In this piece from Mountaineer magazine, we revisit Mary Anderson's report on Campcrafters, a committee she helped to form in the mid-1940's. Mary was a dedicated Mountaineer and the co-founder of REI. Born Mary Gaiser on December 7, 1909, in Yakima Valley, Mary loved Washington and the natural world from a young age. She moved to Seattle and taught grade school until the mid-1930s, all the while sharing her love for wild places with her students. She was especially passionate about biology and natural history. Together with her husband Lloyd, Mary joined The Mountaineers in 1929. They were among the earliest graduates of our basic climbing course in the mid-1930’s and students of Mountaineers legend Wolf Bauer. Immediately after graduating, they began sharing their love of the mountains by instructing other aspiring climbers. They were among the first climbers to use new ice ax techniques lauded by the next generation of Mountaineers. The only trouble was ice axes were expensive and nearly impossible to find in the Pacific Northwest. That was a solvable problem for Lloyd and Mary. They created a “buying cooperative” to order in bulk from Europe, making climbing gear, and eventually other products, easier to find and more cost effective than other options. Thanks to Mary’s German translation skills and Lloyd and Mary’s keen business acumen, REI was born in 1938. They operated Recreational Equipment Cooperative in their attic (and kitchen, and dining room) of the West Seattle home Lloyd had built for many years. Eventually, Mary retired from teaching and took over the everyday operations of the co-op. She stitched cotton into tents, packaged food into expedition-ready boxes, and handled ordering and deliveries. Mary continued to be heavily involved with The Mountaineers, supporting Lloyd’s ambitious climbing schedule while nabbing a few first ascents of her own. Like Mountaineers today, Mary and Lloyd gave so much of themselves to The Mountaineers that at the 1953 Annual Banquet Mary was presented with the Annual Service Award. She was recognized for her outstanding work serving on the board of trustees, with two terms as secretary and two as treasurer, four years on the Climbing Committee while the climbing course was being organized, and for her willing help with many other groups and committees of the club. Campcrafters was one of those committees. It originated in the mid-1940’s, enabling climbers to invite their families to join them on adventures in the mountains. Families would gather at “base camp” and hike at lower levels while their parents climbed more technical peaks. Every year, the group would schedule a dozen trips to local parks and wilderness areas and one big adventure. Of the twelve week-end trips offered on the Campcrafters’ schedule this season, all were fun, but for thirty-two Mountaineers the real trip of the summer was the Selkirk Lake Louise Gypsy Tour. We converged on the Selkirks from all directions. The main body of the party drove from Seattle via Spokane, Radium Hot Springs and Golden. Sunday evening, July 2 1, found us with our camps well established. Campfire that night was enlivened with accounts of sleeping in the wheat field outside of Ritzville, of the sympathetic truck driver who taught Frieda and her women passengers how to operate a bumper jack and with the tale of the Castors, whose car had delayed them a whole day and how they fought against time to get to the border before the nine o’clock closing. Climbs of Tupper and Abbott were the prizes on Monday. Tuesday the climbers rested, played with the ground squirrels, gathered wood and rested again, but the tireless walkers went to Glacier Crest. On Wednesday Castor and Pollux bowed to the climbers. Some people walked up the Asulkan valley, but the real event of the day was the trip to the fan house and the receipt, by the Dodges, of an invitation to bathe. The next evening campfire was delayed until the “return from the bath” so that all could admire two really clean humans. Arrangements were made with Joe Butterworth for a trip to the caves. The eerie light of the gas lantern, Joe’s gnome like figure squatting on the wet rocks, the water’ pouring over Jacobs Ladder and down our necks made up the memories for Thursday. Campfires each night had been fun. There were Hilda’s yodeling songs we all especially enjoyed. There was circus night with its human mosquito, its ice-ax swallower and its pink lemonade. There was charade night when mountains made drama. There was hot gingerbread from the reflector ·ovens, biscuit twists and marshmallows. Friday’s campfire was special not only because of the account of the Sir Donald climb, but because it was the “last campfire” for our one-weekers. For those who could stay a trip to Rogers Pass was scheduled for Saturday. At campfire, Mr. Hopkins had given an account of all the things one could see and do at Rogers Pass. The truck’ arrived early and the crowd rode the four miles up to Rogers Pass and then, having had their minds made up for them by one of the party, rode gaily back to the Balu Pass trail. They followed the trail up through the meadows to Balu Pass and the view of the many mountains and glaciers. Views of immense, fresh grizzly tracks in the snow proved exciting and there were no stragglers along the trail back to the truck. The second week found us caravaning by car from Golden to Yoho Valley and then to Columbia Ice Fields. Scenes such as beautiful Emerald Lake, Takkakaw Falls and the breath-taking views along the Jasper Highway filled our days. Camp was established at the Columbia Ice· Fields so that the climbers could try Athabasca. The climb was successful, but proved long because of severe avalanche conditions. We had been in Canada ten days, beautiful, warm, sunny days. We could hardly complain if our deluxe, private camp, established by special permission of the Lake Louise Ranger in his deserted “conche” camp, proved a little damp. Here we made plans for a reunion and sang our last goodnight song. In the morning we took the road through the beautiful Kootenay and Vermillion River valleys back to Radium and sunshine, homeward-bound. Personnel of the 1977 Campcrafters trip: Seattle: Lloyd Anderson, Mary Anderson, Ruth Anderson, Sue Anderson, Cran Barrow, Burge Bickford, Frieda Bickford, Nancy Bickford, Elsie Burkman, Bob Castor, Bunny Castor, ‘Marion Castor, T. Davis Castor, Patty Crooks, Bill Elfendahl, Margaret Elliott, Marian Lundberg, Jule Marty, Kieth Norden, Kenneth Norden, Phyllis Norden, Jane Osterhout, Mary Osterhout, Sophie Sporrer, Patricia Willgress. Everett: Hilda Bueler, Loleta Jones Tacoma: Ethel Dodge, Tom Dodge, Jessie Northcutt, Agnes Wood, Tommy Wood. Mary Anderson passed away on April 3, 2017. She was The Mountaineers longest-standing member at the age of 107. Mary and her husband Lloyd were firm believers in sharing outdoor adventure with their children. 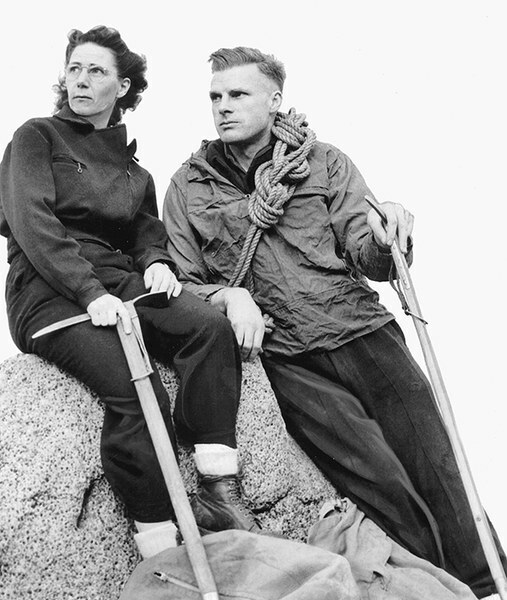 Mary was a Washington State native, co-founder of REI with her husband Lloyd, one of a handful of Mountaineers instrumental in shaping the climbing course in 1936, and a longtime teacher in the Seattle Public School District.